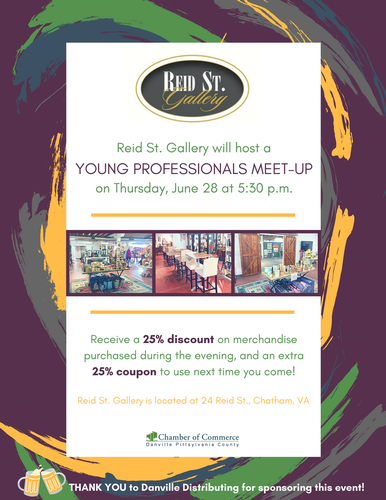 Join us at Reid Street Gallery for our next Young Professionals Meet Up! Enjoy hors d'oeuvres, drinks, networking, and a 25% discount on merchandise purchased during the evening. In addition, you will receive an extra 25% coupon to use the next time you visit Reid Street Gallery! To join the Facebook event, click here! Be sure to click the "REGISTER TODAY" button on this page to RSVP, and we hope to see you there! Reid Street Gallery, 24 Reid Street, Chatham, VA.